As we pointed out at the time, these appear to be a great lesson in diminishing returns, with some of the state highways due to be supersized having fewer than 10,000 vehicles per day use them. That’s far less than even many local roads in Auckland. As such, this represents a massive opportunity cost. It is money that could otherwise go towards creating a world-class public transport system in our major cities or making significant improvements to road safety across a much greater part of the country. At the same time, over the years and during this election cycle the government have been talked extensively about the need for robust business cases and their economic prowess. However, the low volumes of many of these roads suggests that quite a few are likely to have poor business cases. It turns out that at least one of them does. Just a few weeks before the announcement, the NZTA stated talking about the road between Te Hana and Whangarei. This included releasing a business case for improvements to the road. Mysteriously though, when we looked for the document again after the government announcement it had disappeared. Luckily Google cache had saved it, including comments such as that a 4-lane expressway (a RoNS) can’t be justified within the next 30 years. We thought the removal of the business case was odd and so Harriet fired off some official information requests to ask why it had been removed. 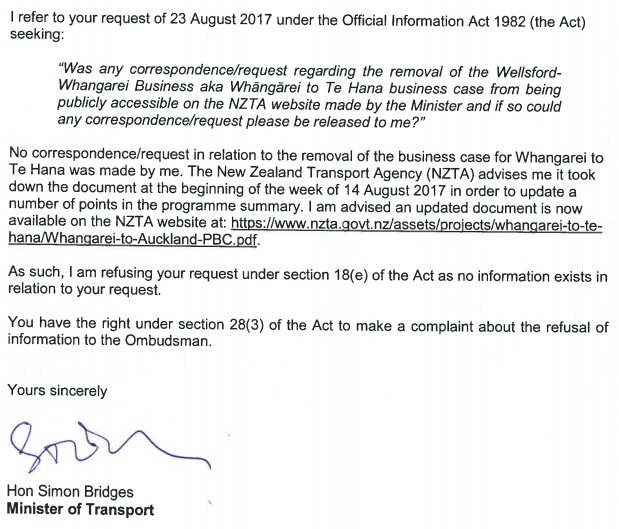 Simon Bridges replied first saying the NZTA took it down to update some details. A few days later the Ministry of Transport replied saying it wasn’t them either. Finally, the NZTA replied yesterday. They found three documents related to the issue which they provided and suggest a very different story. 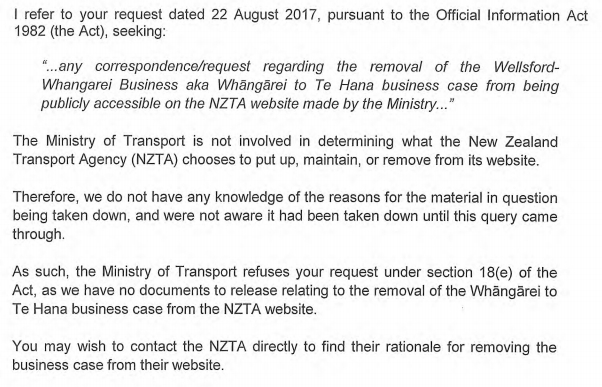 Two are replies to this email from an NZTA staff member saying the minister’s office requested the details be taken down, less than two weeks before the policy announcement was made. And one of the replies less than 10 minutes later saying it had been done. The other one appears to be from someone else also saying they’d do it straight away. A third email comes in response to our post questioning why it had disappeared. 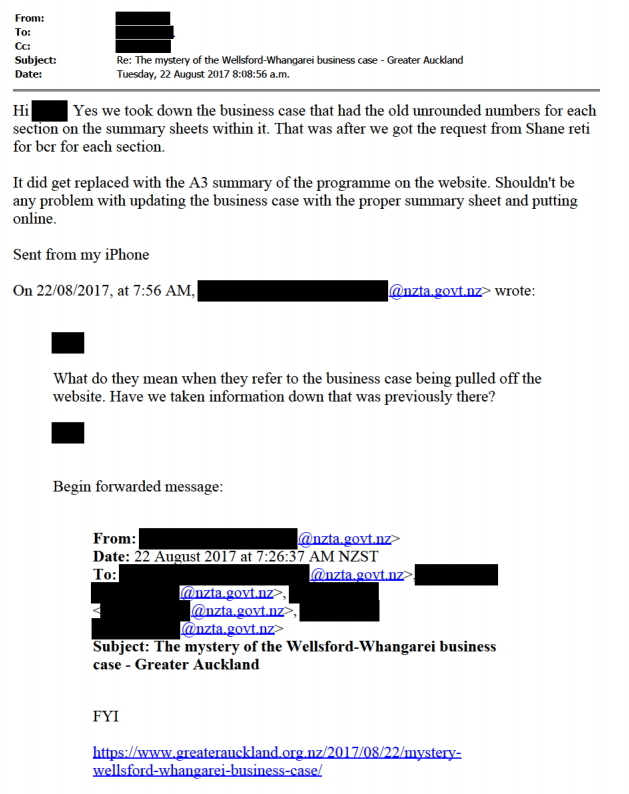 In their response to the OIA and the alarming comments from those emails, the NZTA claim it was all a “complete misrepresentation of what occurred”. This seems barely believable given the very specific language that is used in the initial emails. It’s also not like this would be the first time the minister’s office has got involved in the release of business cases. Regardless of what’s happened with the business case, I think what’s ultimately important to remember is actually what’s in the business case. Even with the best analysis the NZTA can come up with, a four lane expressway just doesn’t stack up. This project is a poor use of our precious and limited transport budgets. I know it’s bad but it’s also quite funny. Bad, appalling more like. So squander money like there is no tomorrow. Not the first NZTA infrastructure waste unfortunately…Kirkbride intersection to Auckland Airport is another. Apparently costs have ballooned well over$200 million now – a road bridge over the motorway would have been about $60million. Wow. I’m really enjoying the investigative articles, you’re doing a better job than the mainstream media! Not a high standard to reach but I total agree with you. Just embarrassing for the media in this country that part time volunteers do a better job than them. At least NZTA released it. A little subversion there? Ooh how exciting. If this is the case then Bridges could be in trouble with the Ombudsmen. While he might not have personally made the request, it did come from his office and he should have checked. Perhaps he felt he could use plausible deniability by adding “by me”. It will take some effort to remove politicised corruption like this from the public service after the change of govt. Sacha – Don’t forget that politicised corruption comes from all stripes of government in this fair land; just some more than others. no is really surprised by this though are we … just another slightly corrupt, politically distorted thing to happen with this extremely sketchy and dodgy government. So there was an investigation and confirmation that the first email was a “complete misrepresentation of what occurred” yet you choose to run with the idea that the minister lied. We do appreciate good journalism, but please let’s remember that heresay is not proof. Everyone deserves the right to be presumed innocent until guilt is proven. Again heresay is not proof. ‘Cos then it would be really really clear. Thanks, Keith, needed a little more humour. What do you have to say about the KR stuff? Do tell. What possible reason would the staff member have for initially saying the ministers office wanted it removed if that wasn’t the reason. So they are spending a billion dollars building a road that isn’t needed for thirty years, and hiding the business case that proves it just before an election campaign?? This should be in the Herald. So much for a transparent and impartial public service. Yes but we knew all that with the last post. These OIA responses show way, way more. 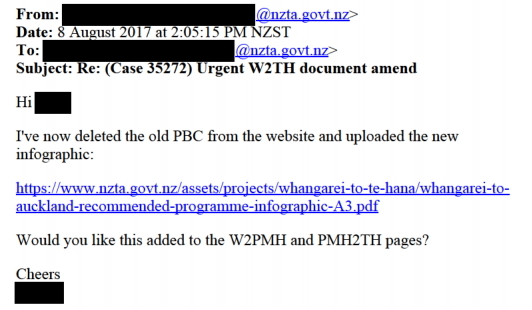 Fact: an NZTA employee believed s/he was removing the business case, all links and anywhere else it may be appearing (just to be really really thorough) from the site from the website AT THE INSTRUCTIONS OF THE MINISTER’S OFFICE. Fact: NZTA now claims that this was incorrect and a complete misrepresentation. Fact: The Minister claims no involvement with the removal of the bc. Of course people make errors. But let’s think about all the possible errors that employee (or whoever in the chain of command that made the error) COULD have made: S/he could have thought incorrectly that the removal was because someone had copied down the wrong excel formula in the calculations, or that it was because someone had copied over a set of data from the wrong road, or that someone had used the wrong percentage for something, or that the business case had been peer reviewed and needed some updating… all these are believable misunderstandings. Misunderstanding that the business case should be removed because the minister’s office requested it is too huge a coincidence to believe. It is exactly the smoking gun that Harriet was looking for. Nobody would make this mistake UNLESS THEY WERE IN THE HABIT OF REMOVING INFORMATION AT THE REQUEST OF THE MINISTER’S OFFICE. And we know the minister has interfered with information release at KR. What this OIA suggests is that both the minister and the agency will attempt to cover this meddling up. Well put. No matter who wins on Saturday, questions should be asked on this in parliament. On a similar note, there was a story last night on the most expensive road anywhere in the world. Surprise surprise, apparently it is the East-West Link – now officially costing more per kilometre than any other road anywhere on the planet,ever in the history of time. That’s quite an achievement. And not of the good kind. $327million/km worth of bad decision making. But getting back to your main story – the minor roads in National’s $10.6 BILLION election bribe – because, let’s face it, that’s exactly what they are – roads with under 10,000 per day, pledging to be made into 4 lane highways? Bill English was on National Radio this morning saying that this was because 90% of Kiwis like to travel by cars, and so more roads needed to be built to satisfy that need. While in no way justifying East West Link, which surely takes the record in New Zealand, and may well be the most expensive surface (non-tunneled) road anywhere, strictly speaking, there has been worse. In Sydney, the WestConnex project is costing an estimated (still not final) $16.8 billion for 33km, or 509 million Aussie$ per km. But overall I agree, the costs are getting ridiculous. That Millau Viaduct in France (the very high bridge) cost less! As for spending in the regions, as I said before, big projects like this are not for them. They are for the city-based big construction companies that will pick up the contracts. What firm in Whangarei will have the capital to bid for a billion dollar roading job? None. We would employ just as many people in the regions if we took half the RONS money, and spent it on more rural road maintenance and small jobs (like those Northlands bridges). Then spend the other half on major urban public transport projects. The East West link may be needed, but it is the route that they have chosen that is just so wrong. Along a marine foreshore which no one in the world does anymore, and constructions at the bottom of the Ohehunga Mall road which will completely cut off access to the harbour and the water. This in an area identified for intensive residential development by the Auckland Unitary Plan, and Panuku Developments, and which residential development has already started. The existing route along Neilsen St is perfectly placed for redevelopment and re-engineering and would cost 1/6 th of the crazy ridiculous cost of the one being discussed at the resource consent hearing at the moment. The mitigations being proposed by the submitters would make the project even more expensive over and above the already most expensive road in the world. Funny how that “financially unconstrained environment” never rates a mention when public transport funding is being discussed. Good work keeping them honest (by fair means or foul), thank you. Of course Auckland’s roads will be busier than SH1 up to Whangarei: they’re in our biggest city for heaven’s sake (density, etc)! However if you take your logic to its extreme, we wouldn’t have a sealed State Highway up north of Kaitaia – there not being many people living there / not many vehicles travelling that way. What seems to be ignored is that, for significant stretches, SH1 between Auckland and Whangarei is virtually the only road in or out of Northland, and is very susceptible to slips / flooding / accidents – not helped one bit by its dismal alignment and some even shadier driving – I lose count of how many ‘near misses’ I’ve seen on it. Perhaps instead of polemics about wasting money on “supersizing” a rural road (I’d call it inter-urban) and the low BCRs thereof, a costed solution that resolves some of the environmental hazards / safety aspects of the route, without breaking the bank on a full-size expressway, might be helpful? Then we can say – here’s a better option, let’s spend the rest on PT in Auckland / Wellington, etc. Like the business case did? You are right to ask these questions. Northland has been ignored too long. Economically, how was its agriculture and horticulture supposed to be able to perform, for example, without any comprehensive research into its unique climate, soils, insect and disease regime? A road of this type induces traffic. A consequence of this is that the danger on the main highway would be transferred to many other unimproved rural roads, through an increase of traffic there. Economically, the report that I often quote “The Impact of Road Projects in England” shows how roads have not delivered economically. We cannot blindly believe anyone who says they do. Northland needs an integrated land use, jobs creation and transport strategy. Improving certain roads could be part of that, but so could rail, a comprehensive bus network, improved coastal connections, protection of waterways and forests, erosion prevention, support of local initiatives to develop their strengths into business ideas, and much much more. What I am convinced of is that the decision to build a road cannot be left to NZTA. Their traffic models are outdated and incorrect, biasing the business cases in a way that is well-documented. As we’ve seen here, kowtowing to their political masters is an accepted part of the culture at NZTA (with no less than three individuals taking action to do so). 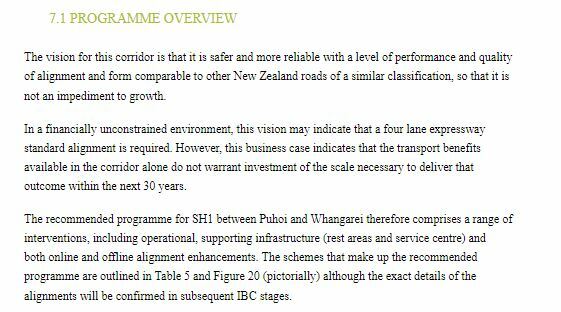 The National Party appears, in turn, to be a puppet to the road construction industry, with its roads policy that takes so much much-needed money from other possible programmes (health, education, job creation) to use on roads that, according to NZTA’s own analyses, don’t deliver. We need a wholesale change in decision-making for planning, using social and environmental well-being as the markers of success, not corporate road construction profits. Where NZTA can excel is in designs for safety. There are many excellent traffic and safety engineers there, and they need better support to introduce processes that improve human safety – including cyclists and pedestrians – rather than having to compromise them in the blind goal of improving traffic flow. Thank you for your considered reply. Agree 100% on rail to Northland / Marsden, and in need for better PT resource here. NZTAs ‘fig-leaf’ acknowledgement of mult-modal options for so many of their projects is the biggest frustration. So yes, perhaps sort the rail first of all. Between Wellsford and Kaiwaka, yes. Otherwise, not so much. nope, even Wellsford to Kaiwaka has alternatives, namely, the Mangawhai Road. Indeed, via Mangawhai is an alternative – in the broadest sense of the word. But it is even more cart-track-like, narrower and more tortuous than SH1. Also, I’m pretty sure the residents of Waipu Cove, etc aren’t exactly thrilled every time all the trucks etc get diverted that way. Going north, the first Mangawhai turnoff is just past Te Hana – unless you’re suggesting getting there off SH1 from Wayby via the backroads of Tomarata. Otherwise, it’s Kaiwaka. Still a tiny stretch of road, in any case. I think you will find the majority of vehicles to and from Auckland travel via Wayby since the last bit was sealed a number of years ago, it’s no more a back road than the others. So for clarity is National going to build these ten new RoNS before they build the ten Northland BTN (bridges to nowhere)? We have forwarded our submissions to NZTA after an incredibly flawed post submission process experience; Te Hana to Whangarei Bypass the Brynderwyn’s High Rd. It purports to come down the Brooks Rd area, Waipu. If it’s true, that traffic volumes dictate that the Road won’t be needed for another 30 years, and yet we are expecting NZTA to advise us soon, which property’s in our area they plan to purchase, (even though our road didn’t exist on the Website info) does this mean that NZTA are planning to evict us from our homes (lifestyle blocks)and land bank for 30 years,? Yeah well the 30 year game plan changed a lot with sudden plans to now export Aucklands PORT operations to marsden point asap 30 years ahead of schedule. Although isnt it reassuring to know that when Aucklanders reach their sir jonkey Rockstar, downtown waterfront precinct, I T pedestrian, latte sipping status that not one of them will even give a proverbial rats arse for the many northland property owners who have had hopes dashed, plans put on hold and have suffered confusion and stress because of the procurement process via the public works act for thier 10s of thousands of acres required for this new road. As an Aucklander you would have my support, however I suggest generalising and slagging off Aucklanders is not the way to win wider support. Keren, just been talking with friends also affected near Waipu. You’re probably aware, but just in case you’re not, there is a Brynderwyn’s group that are supporting each other through this. Let me know if you need info about them. Stephen, I ‘ll be even more blunt with you. i have zero sympathy with your position with respect to the public works act – it is what it is. But if you said to me that this roading project is economically wasteful; likely to produce little benefit for Northland; and is contrary to everything that the country is required to achieve under the Paris accord then I would be 100% behind you, or more likely leading the charge from the front. And remember, life iss not always about me!